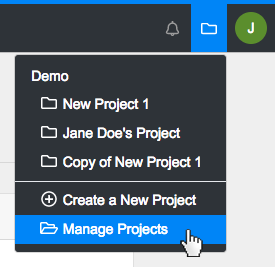 The key to managing your projects in Innoslate is accessing the 'Manage Projects' dedicated page, located within your Organization Dashboard. This page allows a user to create, copy, delete, export, filter, search for, share, unshare yourself from, and edit the settings of Innoslate projects. When you first sign in to Innoslate, you will find yourself in your Organization Dashboard. From here, click the grey 'Manage Projects' button in the 'Recent Projects' panel. From any view of Innoslate, you may also access the 'Manage Projects' page by opening the 'Switch Projects' drop-down located on the top navigation bar and clicking the 'Manage Projects' menu item. Below is a list of available functions and a short description. Click on the name of a function for more information. Creating Projects Creating a project allows you to add a new project within your Organization. Copying Projects Copying allows you to create a duplicate of an existing project, to includes all entities, diagrams, uploaded files, and comments. Deleting Projects Deleting a project permanently removes that project from your existing projects and deletes all associated data. Edit Project Settings Renaming a project allows you to change the name of an existing project so you can better distinguish it from your other projects. Exporting Projects Exporting a project allows you to create a local backup of your project which can then be re-imported at a later date if need be. Searching for Projects Using the 'Find a Project' feature within 'Manage Projects' allows you to search for an existing project by Name, Description keyword(s), Project ID, Folder, or date Created. Sharing Projects Sharing a project gives another Innoslate user within your Organization access to your project with a certain level of permissions. Unsharing Projects Unsharing projects allows you the option to remove a user's access to your project, that was previously shared. You can also 'unshare'/remove yourself from accessing a project that another user has previously shared with you. 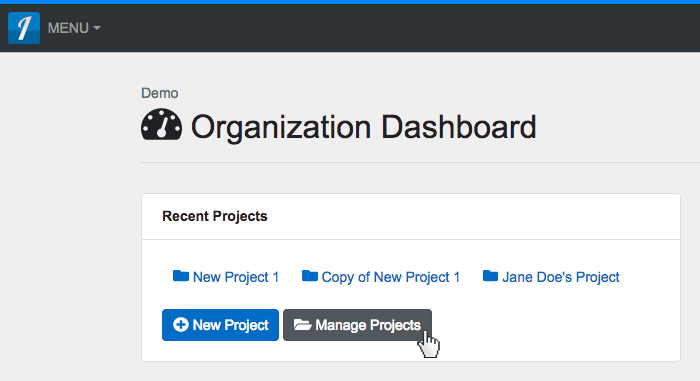 The key to managing your projects in Innoslate is accessing the ‘Manage Projects’ dedicated page, located within your Organization Dashboard. This page allows a user to create, copy, delete, export, filter, search for, share, unshare yourself from, and edit the settings of Innoslate projects. When you first sign in to Innoslate, you will find yourself in your Organization Dashboard. From here, click the grey ‘Manage Projects’ button in the ‘Recent Projects’ panel. From any view of Innoslate, you may also access the ‘Manage Projects’ page by opening the ‘Switch Projects’ drop-down located on the top navigation bar and clicking the ‘Manage Projects’ menu item. Searching for Projects Using the ‘Find a Project‘ feature within ‘Manage Projects’ allows you to search for an existing project by Name, Description keyword(s), Project ID, Folder, or date Created. Unsharing Projects Unsharing projects allows you the option to remove a user’s access to your project, that was previously shared. You can also ‘unshare’/remove yourself from accessing a project that another user has previously shared with you.